Yup those were the exact expressions I had while watching this episode. It was cute, funny, and sad all at the same time! I love how this sitcom hits you with the funny than totally throws a bucket of sadness at you. The vampires come back after they had did some exercise. Soo Hyuk stops them so he could zip up Prince Jung’s shoes. Prince Jung and Soo Hyuk seem to have a really close relationship. Prince Jung does a few short jumps (lol) and they praise how cool he looks. Prince Jung tells Hyun Joong that he’ll need to work hard. Jong Hyun then does his adorable ramble but the important point: girls like guys who exercise. With that said, Prince Jung starts sprinting but it’s slow (LOL). Hyun Joong hears something and shouts that it’s dangerous. Luckily for Prince Jung, Soo Hyuk rushes over quickly and breaks the flower pot that’s about to land on Prince Jung. Wow…did he break it with his head? Soo Hyuk asks if Prince Jung is okay and then growls: who would dare to hurt Prince Jung? Hyun Joong states that it was the wind that caused it. Soo Hyuk gets more brownie points with Prince Jung. Outside the building, Sumi’s friend bumps into them and asks if they just went to exercise. She tries to sneeze but it won’t come out until the vampires leave, then she sneezes on Soo Hyuk. The president is heard shouting for everyone to come out to the living room so the vampires crawl out of the piano. They see Soo Hyuk sitting at the piano sleeping and wonder what is wrong with him. Prince Jung asks if he’s tired to which is kneels down and says no. Prince Jung tells him to just go rest, but he refuses. Soo Hyuk touches his face and his nose, noticing that something is off. Prince Jung tells him to go and they walk out. Outside in the living room, the family members are cleaning except for Kwang Hee who is just bossing them around. Woo Hee tries to escape cleaning but her father tells her that this is what a family should do. Minah demands why Kwang Hee doesn’t work and he says how he’s not feeling well and I think he says something about family should care about one another. Manager Shin finds a bread hidden under a pillow on the couch and Minah runs to grab it because it’s her. She trips and falls face flat. The vampires are hanging out in the kitchen when Minah comes in to ask Sumi for help with her nose bleed. Minah walks over and asks Soo Hyuk if she has double eyelids and they all panic as they try to get her away from him. However with his cold, he’s not able to smell anything. The vampires don’t know what a cold is, so they assume that he’s finally overcome the blood lust! Soo Hyuk walks into the bathroom and tries to smell different things, but he can’t smell anything at all. He goes outside with Prince Jung and revolves around him to make sure nothing happens and that he’s safe. However, he fails to notice the smell of poop so Prince Jung ends up stepping on it; it could be that Prince Jung failed to see it himself, but nevertheless, it is Soo Hyuk’s fault. Soo Hyuk tells him that he didn’t smell it at all and Prince Jung retorts that it smells like crazy! He walks away in a huff and go back inside their home where Woo Hee gets mad at him for bringing that smell in there. 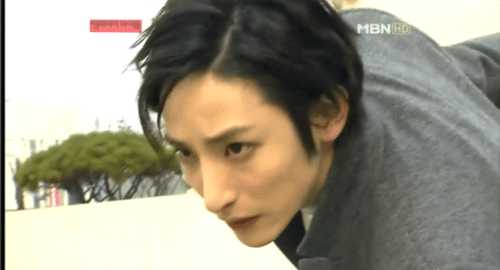 Prince Jung tosses the boot to Soo Hyuk angrily and Soo Hyuk smells nothing still. When Prince Jung has finished taking a refreshing shower, Soo Hyuk kneels there apologetically. 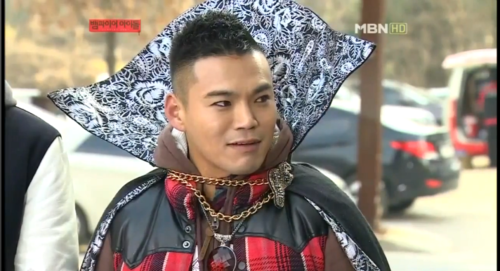 But he fails as Prince Jung is still angry with him. Prince Jung just tells him to move and he walks followed by his minions. 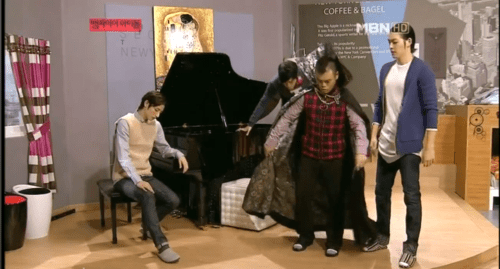 Soo Hyuk staggers and accidentally pushes Prince Jung. Soo Hyuk fails to catch him though since he sees double vision. Jong Hyun and Hyun Joong are shocked as Prince Jung falls down the stairs and lands right under Woo Hee’s skirt. Uh Oh. Remember the last time she got angry? Luckily for him, she didn’t blow a huge gasket an d walked away in a huff after Kwang Hee teased them. Soo Hyuk asks for forgiveness again but this is the last straw and Prince Jung tries to beat up Soo Hyuk, but the minions hold him back. Soo Hyuk realizes that his throat is starting to hurt. He talks to the minions: he can’t smell anything, he loses strength, his throat hurts. 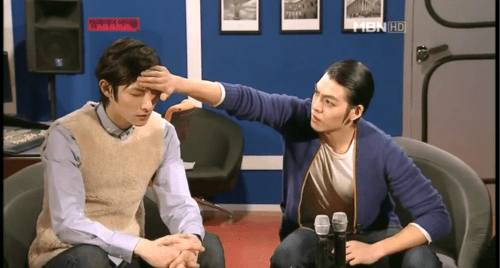 Hyun Joong feels his forehead which is warm and it alerts Jong Hyun. Jong Hyun touches his forehead, checks his eyes and tongues to reach the conclusion that he has a virus. He quickly does a search and says the virus is ____ (sorry I couldn’t figure it out). But it doesn’t look good as Hyun Joong asks worriedly what he did to catch that. Jong Hyun starts listing the facts and the morality rate and Hyun Joong shouts: but Soo Hyuk is 104 years old!! Jong Hyun reads on that it’s contagious!! There is a short cut scene where Sumi tells Manager Shin about the things she did to him and he gives her props. They also talk about the diamond. Then we switch back to Soo Hyuk who tells them that he has to go away and the two yell at him for doing so because he has family and friends. They start arguing and the camera pans out to show that they are arguing in separate rooms. Soo Hyuk has been quarantined LOL. He walks out, gives them a pat on the back before leaving. The two minions talk about how sad it is while taking off their sweaters since it’s been contaminated haha! 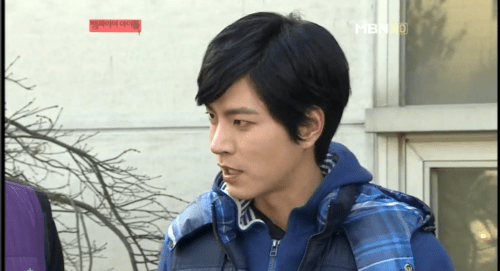 Jong Hyun asks Hyun Joong for help. Soo hyuk goes to fight off his anger because that’s what all hot guys do when they’re frustrated, I was hoping for the angst shower scene but oh wells, see him fly around is still good. He tells them to live happily. He says something about the virus he has and his nose starts to drip. The scene switches to the bathroom where he’s crying (AWWW). He says his last goodbye to Prince Jung before leaving the home. He tries not to tear up while he looks at Prince Jung, who is sleeping, for the last time. He bows and slowly backs away while counting how many steps he is away from him (AWWWWWW). Gahhh why is this so sad even though we know he has the common cold?! Soo Hyuk walks away with a suitcase and his buddies cry on the stoop. They had promised him they wouldn’t tell Prince Jung what had happened to him so he won’t get worried. The sensor porch light turns off on them so Hyun Joong gets up so it can sense their presence LOLOL. They then take turns turning on the lights whenever it turns off hahahahhaa! Hyun Joong misses it once and Jong Hyun tells him to stand up again LOL. Poor Soo Hyuk is trying to toughen it out in the cold as he shivers. He starts sniffling and coughing. He gets up and starts shoveling the dirt in the forest – he’s trying to build a grave for himself. 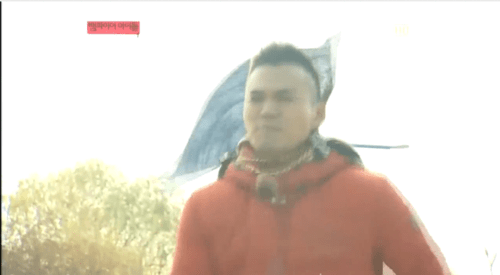 He collapses from using too much strength and Min Kyung who was delivering near there, happens to see him. She walks over there and asks if he’s okay and it turns out to be Soo Hyuk. She touches his forehead and it’s burning hot. He grabs her leg and mutters something about the prince before losing consciousness. Min Kyung has no idea what he’s talking about. Everything he hears is in slow motions as Min Kyung tells him to hold on and endure it. He’s riding in the back of her motorcycle. She takes him to a pharmacy where she gives him a tonic and then takes him to the jimjibang where he can sweat it all out. It’s too hot so he tries to take off his shorts and Min Kyung is preventing him from doing so. The fever has finally died down and she takes this chance to have a good look at him. Min Kyung: The fever has gone down, that’s good. His nose his high. How are his lips so red? So cool/handsome. Min Kyung gets a phone call some a person and she tells him that she’ll go right away. The next morning, Prince Jung is angry that Soo Hyuk ran away. Jong Hyun and Hyun Joong try to not give it away and just reports the facts. Prince Jung gets angry and decides to look for him, however without his trusty minion, he ends up tripping over something LOL. It turns out it was because his boots were unzipped so the the two minions scramble to zip it up. 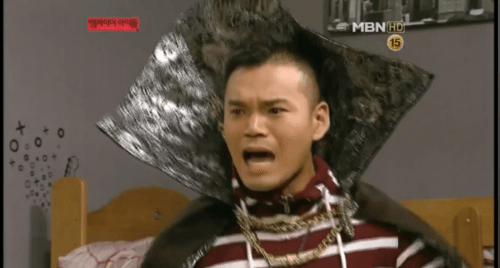 Min Kyung zips by and yells at Prince Jung for being so mean to leave his friend when he was sick. Hyun Joong rushes to block Prince Jung’s ears and Jong Hyun tells her to leave. Min Kyung asked what did Soo Hyuk do that was wrong? He’s at the jimjibang right now. Prince Jung finally hears this and runs over to Soo Hyuk. While he runs, the thought about all the things Soo Hyuk has done for him and Soo Hyuk had used his hand to smash the flower pot, not his head. Oops. Soo Hyuk thinks to himself if he has died. He wonders where he’s at. He then hears Prince Jung’s voice calling his name. He is frantically looking for Soo Hyuk until they make eye contact, but Soo Hyuk holds the door closed. Prince Jung: Mucatil (Soo Hyuk) I’m sorry. (The he says something else). Open the door. Soo Hyuk: I can’t. My virus is contagious. The people in the steaming room move back and are panicking. This part needs no words. Then the people push their way out of the steaming room, giving Prince Jung a chance to walk in. 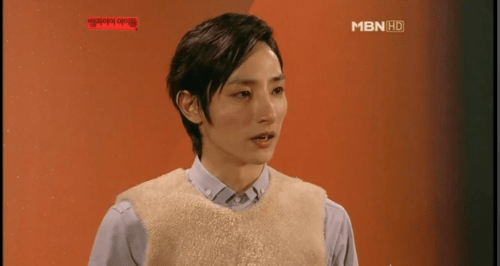 Prince Jung asks if Soo Hyuk had forgotten their promise to be in it together. They hug as Soo Hyuk cries and Min Kyung smiles happily at the sight. Hyun Joong and Prince Jung are now sick and Soo Hyuk takes care of Prince Jung. He asks if he is okay and Prince Jung gives him the “what do you think?” face. He gets mad at Soo Hyuk who apologizes. Prince Jung then shouts for Jong Hyun. 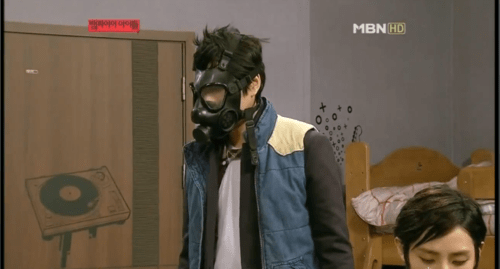 Jong Hyun comes in wearing a gas mask and wiping all the germs from the mask. Prince Jung thinks it’s unfair that he doesn’t have to suffer while the other two do. 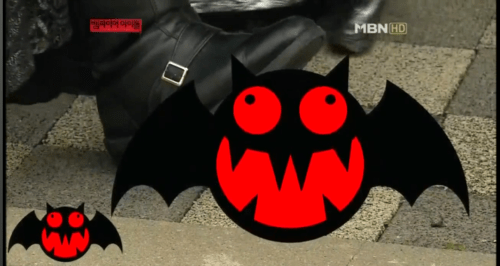 He tells the two minions to grab Jong Hyun and tries to take off his mask but Jong Hyun kicks him. Prince Jung lands on the couch and tries to kick him back, but his legs are too short (lol aww). Jong Hyun apologizes but has to apologize again when he kicks Prince Jung after Prince Jung’s second attempt to get the mask off. It turns into a fight as they all cling onto each other and fall to the ground. (I think it would be hard to not laugh at that scene hahahaha). Yeah yeah, I’m biased, but can’t help it, not when you have those lovely cheekbones staring back at you asking for you to just touch them. His lips too, his eyes. Min Kyung has taste when she was describing Soo Hyuk. So I’m scared to jump the Soo Hyuk- Min Kyung boat mostly because if it sinks, I’ll drown and I hate and have a fear of drowning. Which is why I’ll never go on a cruise unless forced. Thank you Ghost Ship and Titanic. Anyways, this really was Lee Soo Hyuk’s moment to shine, sitcoms generally don’t give actors a lot to work with in terms of emotions like how a drama would because it’s mostly about the funny. But this episode allowed for Lee Soo Hyuk as well as his character to grow a bit more and it was great seeing the heartless robot have some emotion for a change. Now this wouldn’t be a korean drama or sitcom without the bromance that could launch a thousand ships. I love bromance as you all know and to have it so much in this episode has topped my current VI top ep: ep. 6. Now time for me to sleep, still exhausted from the week long retreat. I hope to recap ep 9 soon too! ahhh soo hyukkkk why so cute? !